Nuage Designs: Tell us your story – how did you get into event planning and design? 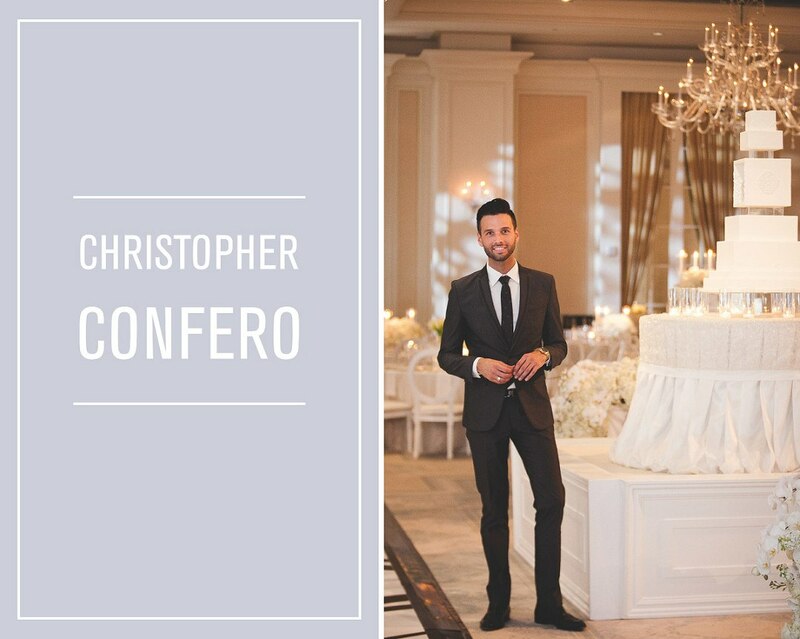 Christopher Confero: I was a performer, so I grew up on stage and was always surrounded by creative individuals. Combine that with a degree in Public Relations and Marketing, and here we are. I still surround myself with creatives, but now my clients are in the spotlight and I’m behind the scenes directing the show. I’m not a checklist party planner. On that side, I see what I do as more time and logistics management. My strong suit lies in scripting the visual story of my clients and creating experiences for those who attend a Confero event. When I am at the helm of a party, every nuance is thought out to ensure cohesive flow. It tells one story, start to finish. ND: You produce events with every little detail in mind, what is your favorite part of the process? CC: It’s so cliché, but seeing the big picture come to life as the final details are placed and the candles are lit will always be a moment I live for. 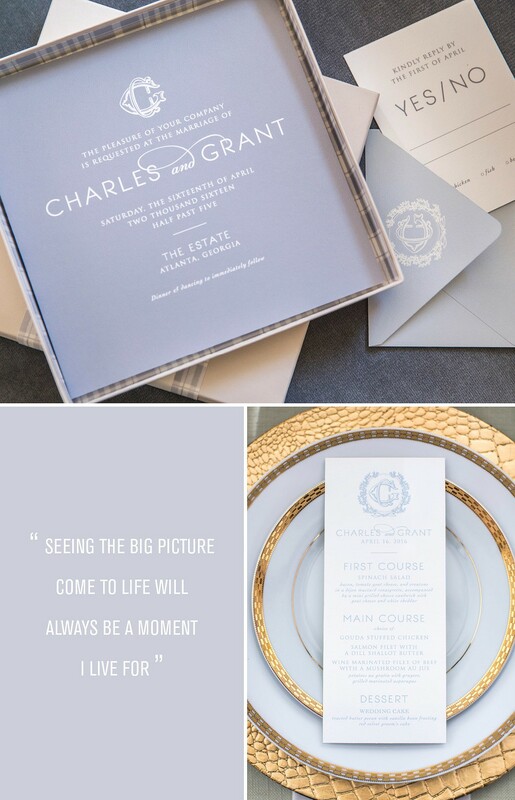 We spend 9 months or more toiling on a party that lasts but mere hours, so every detail is just as important as the next – what paper the invitations are printed on, when the music and lighting cues hit, the dinner napkins are freshly pressed. Elements that are sometimes overlooked tend to be the perfect opportunity to showcase my creativity and provide a broader cohesive vision. Designing the paper suite and the cake are such fun to me and always allow me to push my clients beyond party standards. ND: You seem to always be on the move jet-setting across the globe, how do you pull from your constant adventures for your designs? CC: Sleeping in my own bed is a luxury for me! I feel like I am always on the go, but when I’m working, I always make room for a little play so I dare not complain about it either. I’m blessed to travel often and to so many places. I produced a wedding in Africa earlier this year, traveled to Amsterdam and Paris, all throughout the US, and am currently planning my first trip to Australia for early 2017. So needless to say, yes I am inspired by every location I visit and every person I meet. Even if it’s not an initial “AH-HA” moment, I always store memories away to pull from later as I need them. Cultures can inspire color stories, skylines will inspire stage design. Anytime you step outside, open your eyes and be aware of what beauty is surrounding you – the inspiration is endless. ND: We love all of your designs, and find that they are all so fresh and unique. Where do you look for inspiration? CC: Every single client is different than the one before, and there will never be another after. I aspire for all of my designs to uniquely reflect the style and personality of whomever I am working for. In our initial conversation, I ask them where they shop, what music they listen to, what their date-night spots are or what their favorite travel destinations may be. I have unifying style standards that I implement to every project, but every event is a new show being seen. Now, my brand is very reflective of who I am and my personal style – clean, simple, classic but always with an edge of irreverence. I personally pull a lot from music and fashion. I live for everything Tom Ford – the man can do no wrong. I firmly believe that more is more, but I’m just not a gaudy designer. Editing is the hardest and most valuable thing to learn. ND: How is the collaboration process with your clients? Do you ever find it difficult to push them towards what they might see as an “edgy” design? CC: I feel like “edgy” design borders on being trendy, and as Karl Lagerfeld said, “Trendy is the last stage before tacky.” I am quite lucky in that my clients never try to micromanage my design process. I wouldn’t define my process as a collaboration, but rather that I start with their style and then simply amplify it with my approach to large scale entertaining. While every party is totally bespoke and its own creation, I have a very systematic method of how I execute certain things. Every place setting and seat is neurotically positioned. Every dinner napkin is hand-pressed – and yes, I have sat for hours pressing hundreds myself. It’s these touches that allow for a seamless flow for the eye. You may not notice that all 20 chairs are in a perfect line, but you will notice the one that is out of place. When these things are perfectly presented it ensures that future clients trust me to dream and create without interference. ND: With wedding season upon us, what trends/colors/styles are you looking forward to using for fall/spring? CC: Trends are something I shy away from completely. 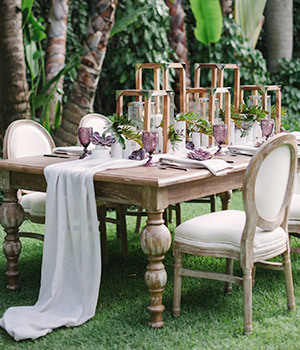 Hand to heaven, I’ve never used the chevron pattern or burlap – and only mason jars once in 2009. If it’s trendy now, it’s going to be out-of- date soon enough. I aim for classic design interjected with my client’s individual style. Looking to the seasons ahead, I would love to see people make bold (but smart) color choices. We all love blush and bashful, but let’s put it to bed ladies. Now I’m not saying pull all of the crayons out of the box, but select one dominant color and be brave! A rich plum with rose gold and navy accent for fall – yum! ND: What else is on the horizon for Christopher Confero Design? CC: Complacency is death. I will always push myself to grow and evolve in every aspect of my life, both personally and professionally. Thinking about the not too distant future I have a few things stirring. Mum’s the word, but there are actually some big things coming down the pipe for me in the next couple years. New things are always exciting and challenge our human potential. ND: So, you’re an absolute Southern gentleman but also a totally cool ATL urbanite. If we came to visit you in Atlanta, what would be our 24 hour adventure together? For planning purposes we will plot out Saturday shenanigans. We would start for breakfast at West Egg Café – always a line, but always worth it. The Georgia Benedict is my vice; two eggs, turkey sausage patties and gravy over a split homemade biscuit. I forgo the grits and potatoes and order fruit – I have to maintain this figure somehow! Now that we’ve stuffed our faces, it would be time to work off a few of those calories. The Atlanta Belt Line is a jewel. Though you’d be hard-pressed to complete the entire journey in one day, I suggest breaking it into sections. It connects most of Atlanta’s neighborhoods with amazing views of the city. Whether you walk, run or bike, I’d suggest hopping off at Krog Street Market. Built into a 1920’s warehouse, it’s an eclectic mix of restaurants and retailers. Krog is also home to a tunnel that is made up of ever-changing street art – it’s a must-see while you are in the area. Our lunch stop would be at Cockentrice. If I didn’t weigh you down during breakfast, you have to try the pimento cheese with bacon jam – dear damn it’s good. Back on the beltline and head up to Piedmont Park. It’s 185 acres of open-air goodness complete with several built in attractions; walking/bike paths, Lake Clara Meer, and if it is a Saturday there is bound to be a festival going on. Note that a late afternoon in the park is prime photo opportunity with the beautiful midtown skyline in the background. After a long morning and afternoon of nature outdoor adventure, it’s time to freshen up for our early dinner reservations at Ecco. It’s on the top of my list for favorite restaurants in Atlanta. In fact, it’s my standard first date go-to. The corner booth and round table along the back wall gives the best view of the entire restaurant and kitchen while still being close to your dinner date. If I’ve been a good tour guide and planned the day well, we’d end the night at the Fox Theatre to a see whatever amazing show is on stage. The magic of the Fox is something you have to experience – words can’t even describe it. We’d end our adventure with a nightcap at Proof and Provision, which is in the basement of the Georgian Terrace Hotel. I fancy a Moscow Mule, but they have a drink menu that will literally knock your socks off – or you out of your socks depending on what you drink. ND: Any other wisdom or advice you want to leave us with here? CC: I certainly don’t have any magic words or profound wisdom that are going to change your life. I believe in the power of openness &amp; learning so I would like to share what I feel held myself and so many of us back from reaching full potential. I spent so much of my early career terrified of judgment and worried with being on par with others in my industry – not others who were new to the business as I was, but those who had been in business for decades. How could I expect to be as established in five years as someone is after 20? I was taught to focus on my journey and not be influenced by how or why other people do what they do. I’ve been so blessed to have mentors such as David Beahm to teach, love and guide me. Friends and colleagues, like the team at Nuage, who support and share my work and talent. To everyone and anyone who has cheered me on, words can never express my love and gratitude. As event professionals there is nothing we love more than a great experience. Sometimes seeing the newest lighting gadgets or the latest in molecular gastronomy is what gets us going and other times it’s the simple, almost forgotten, things that bring us the most joy. Such was this case with this 2 Sisters Events dinner produced in conjunction with the Lakelander Magazine. Held bi-annually (and always sold out! 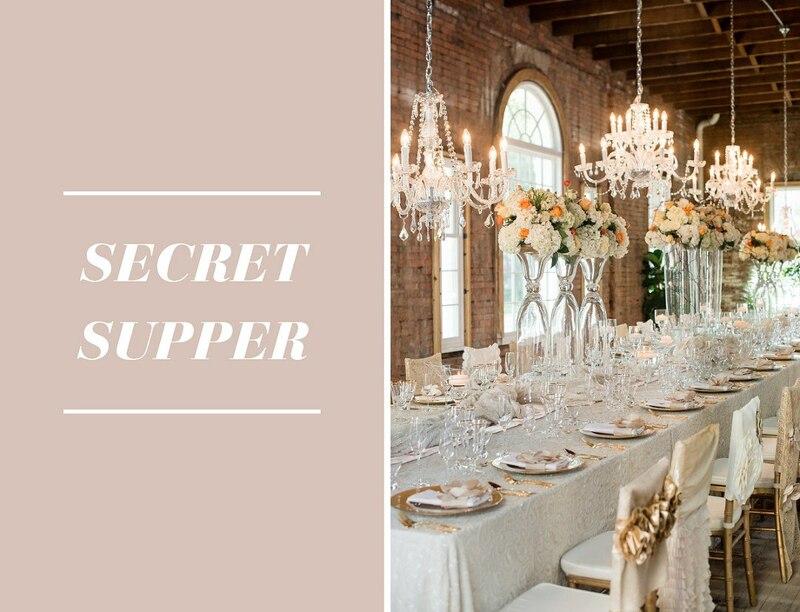 ), this multi course meal is held in a secret location that is revealed only the night before via hand delivered invitation. This time it was hosted at the historic Federal Building in Lakeland, FL. Built in 1917 as the city’s first post office, the building is full of character and charm and was the perfect venue for such a coveted event. 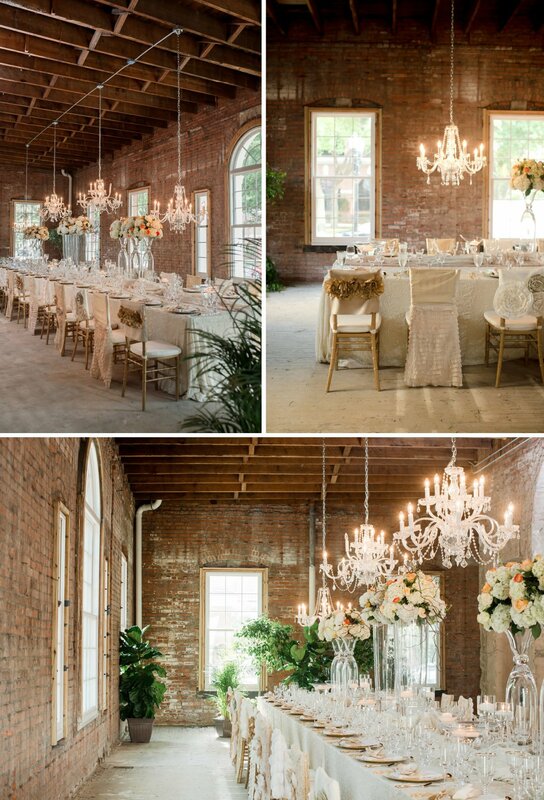 Using the raw space as a backdrop, 2 Sisters Events added warmth to the venue using an ivory palette with accents of champagne and gold. We love how they mixed and matched vintage furniture to create an inviting lounge vignette for attendees to mingle before sitting down to the first course. 2 Sisters Events also brought that same idea into the table seating, using a variety of chairbacks from our Preston Bailey linen collection to give their design an added element of fun! But our very favorite thing may have been the tabletop décor with sparkling chandeliers interspersed between tall blooming florals that added a bright pop of color! Sign us up for the next one, we definitely want a seat at this dinner table! Ever since we first laid our eyes on a watercolor wedding dress we have been madly obsessed (see here and here for some of our faves). The delicate strokes and soft colors are just so dreamy we could barely help but fall in love with the trend. When we realized you could watercolor pretty much anything (see here, here and here) well, we were all in! 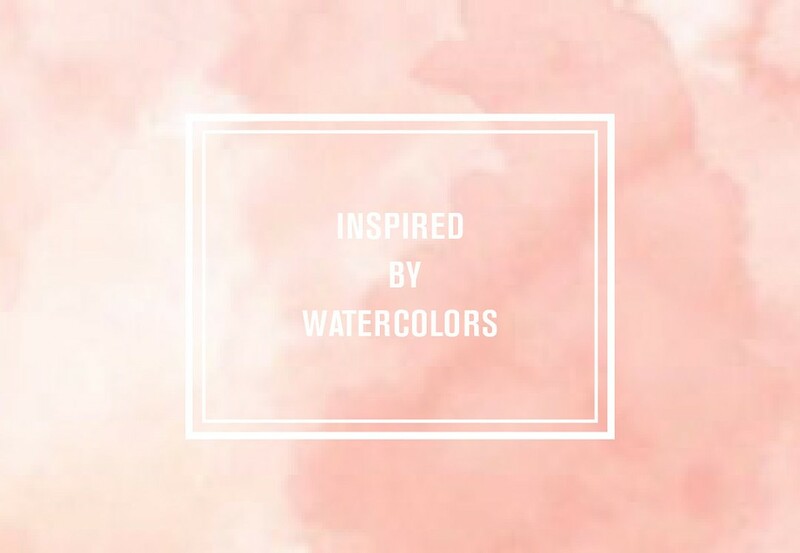 Feeling so inspired by all of the pretty watercolor pieces, we started pinning away a few of our favorite things. Here’s a sneak peek, click over to our Pinterest for the full board! Now imagine our surprise when our friends at Smells Like Peonies Events came to us with their concept for a styled shoot. 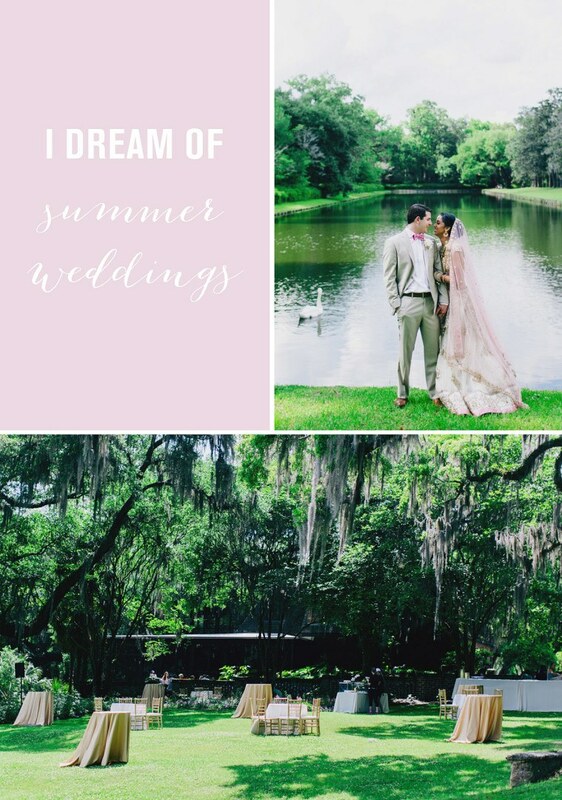 In shades of pink centered around the most beautiful watercolor invitation suite from Dovehouse Handmade and the sweetest pair of floral watercolor print heels from BHLDN, it was a real-life dream. We were beside ourselves! 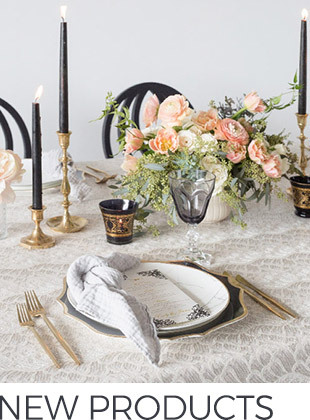 Words cannot describe this impossibly romantic design, so scroll through for the photos from Brianna Wilbur to experience the magic for yourself. And remember, if you pin it, it will come true! Feeling a nip in the air and seeing the leaves start to fade around us, we know that this summer is coming to a quick close. As always, it goes by way too fast and we can never believe it’s over. In an attempt to fend off our impending summer sadness, we’ve turned to a bright and cheerful Luke Wilson Special Events stunner to get us through the last of summer 16. First of all, The Middleton Place. Wow. Have you seen any place like this before? Between the historic gardens (America’s oldest landscaped gardens, to be exact), the house museum dating back to 1755, the plantation stable yards (horses and sheep on your wedding day?) and the incredible Ashley River views we are just giddy. Perfect venue, check. But seriously, just looking at these impeccably manicured gardens dotted with bright purple and pink flowers could get us through winter. Then there’s this gorgeous ceremony. Set against the water, the couple said their “I Dos” under a dreamy Branch Design Studio floral arrangement. The first half of the service was a tradition Indian ceremony with the second half led by the groom’s father, a pastor, in a traditional Christian vow exchange. 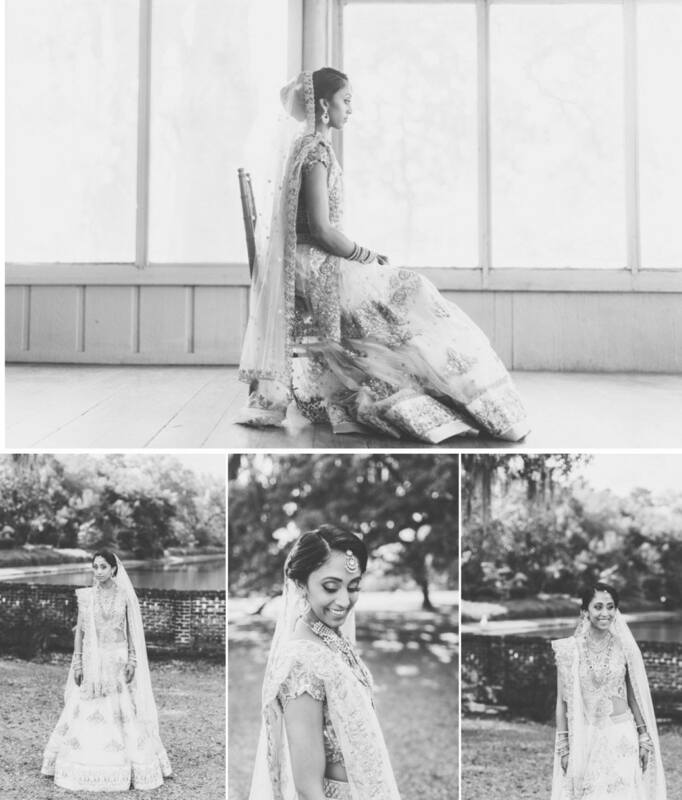 The bride, in her beautifully embroidered ivory sari with rose quartz detailing, and the groom sporting a coordinating pink bowtie, were a sight to be seen as they walked down the aisle with white rose petals floating around them. And of course, there’s the party. 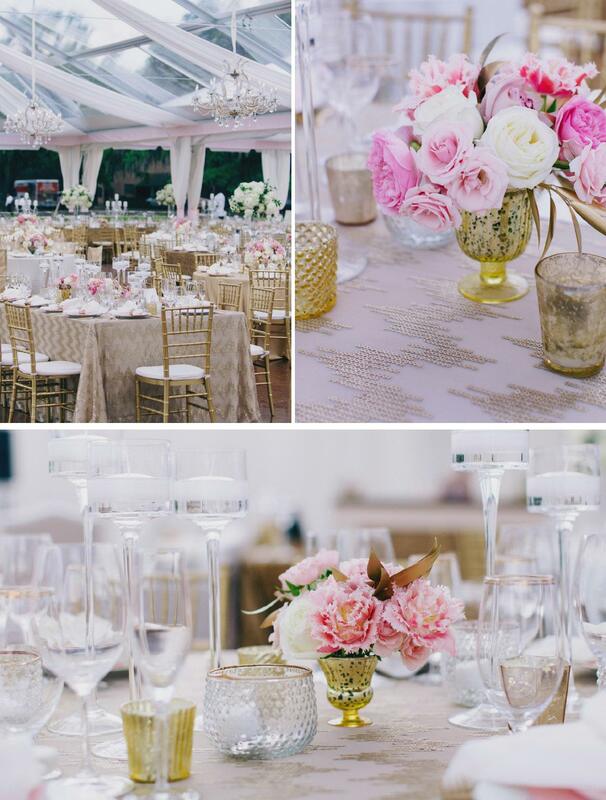 Decked out in white and gold décor, with the sweetest touches of pink, it was just sparkling under the chandelier-strung tent. 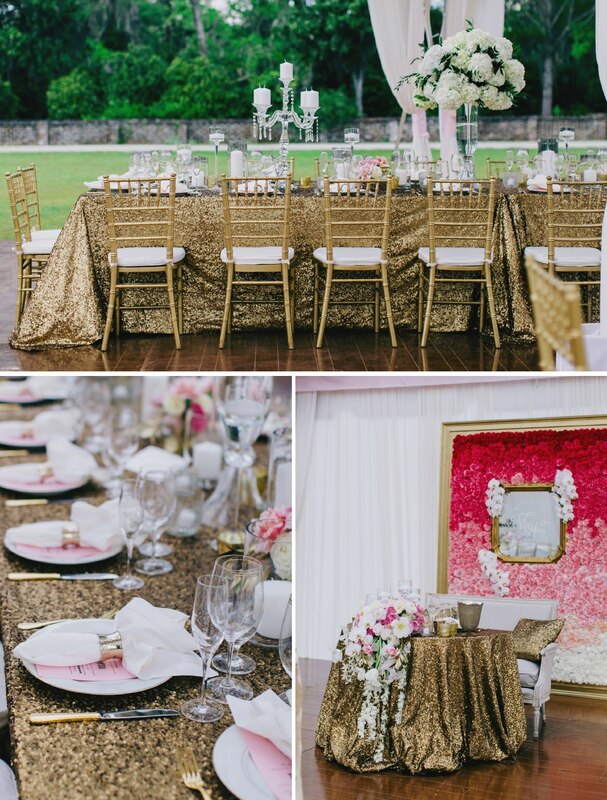 We love how Luke Wilson mixed in different gold patterns on the tables and chairs to give the tent so much dimension! With a blend of hydrangeas in tall glass vases and dainty arrangements in short gold vases, the flowers were in full bloom. Our obvious favorite? 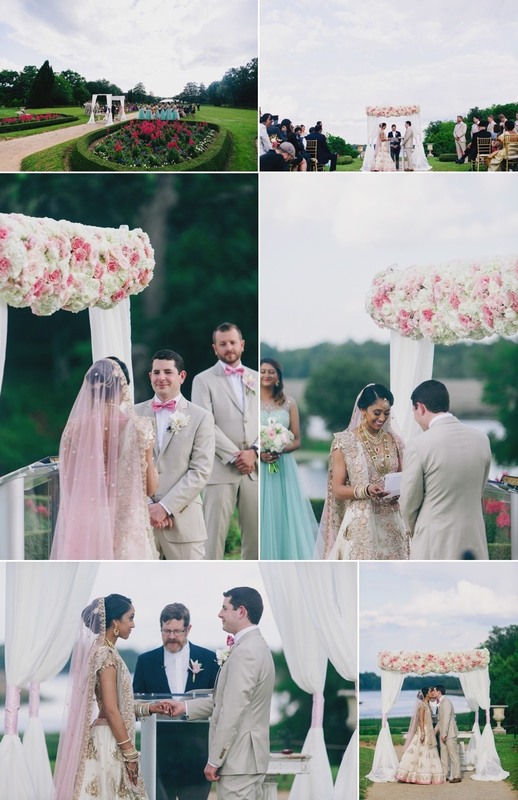 The ombre floral wall from Branch Design Studio framing the bride & groom. 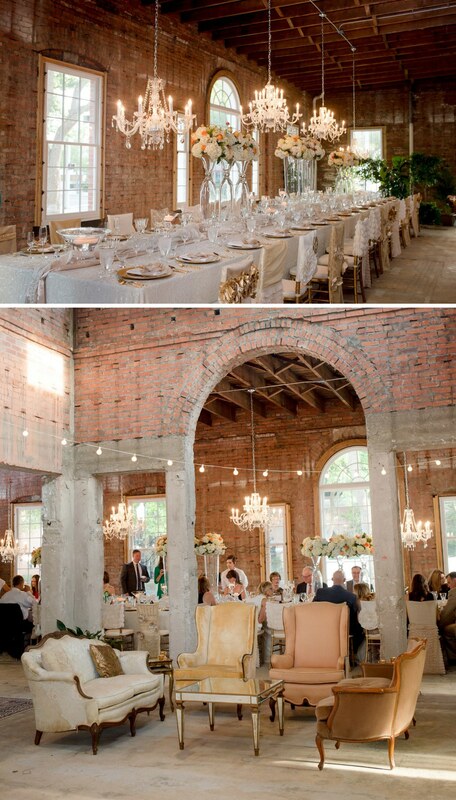 Between all the attention to detail, the bright colors and the shimmering golds perfectly captured by Hyer Images, this dream Charleston wedding is definitely one that will keep us dreaming through the fall! 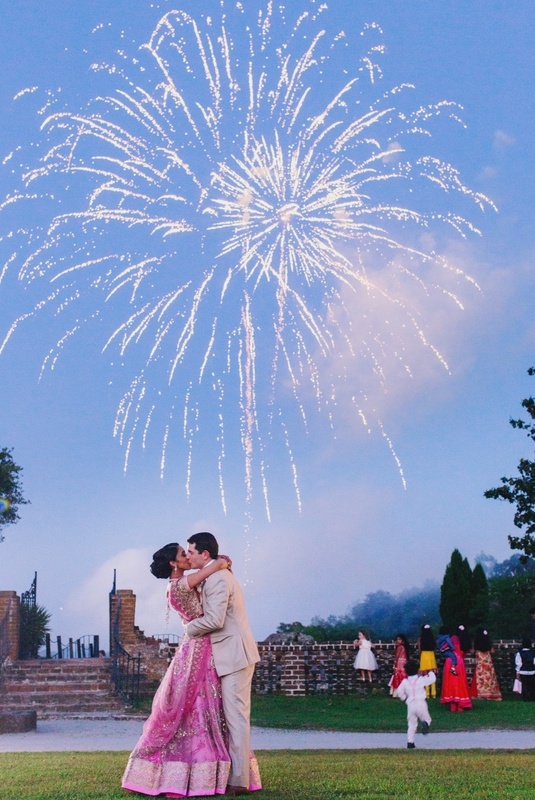 PS – The night ended with the newlyweds sharing a magical kiss under fireworks against a cotton candy-colored sky. Dreams do come true!